Purpose: The application of minimally invasive surgery to liver malignancies remains controversial and difficult, especially in case of liver cirrhosis. 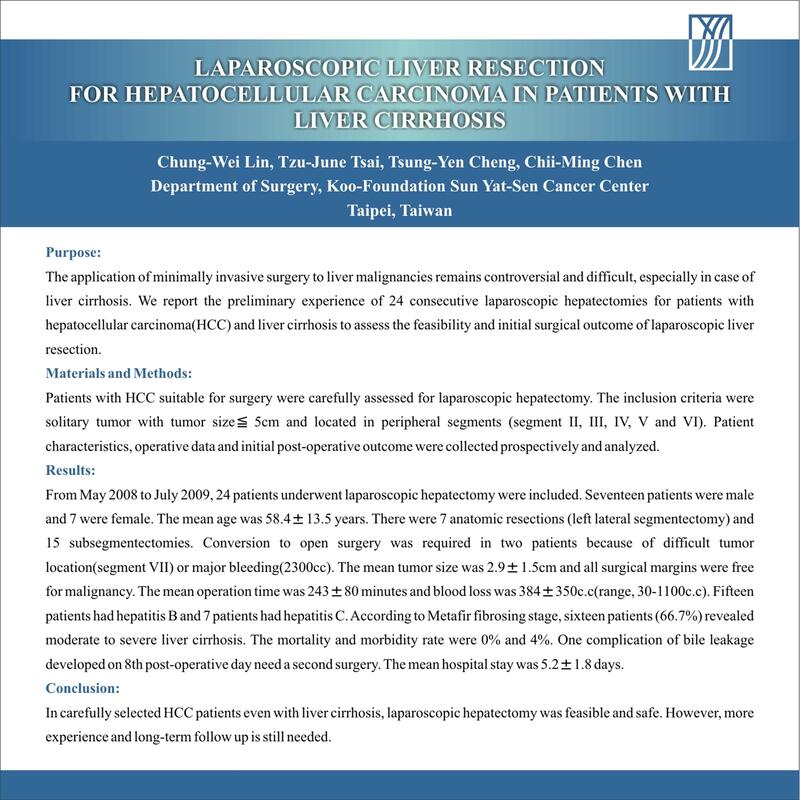 We report the preliminary experience of 24 consecutive laparoscopic hepatectomies for patients with hepatocellular carcinoma(HCC) and liver cirrhosis to assess the feasibility and initial surgical outcome of laparoscopic liver resection. Materials and Methods: Patients with HCC suitable for surgery were carefully assessed for laparoscopic hepatectomy. The inclusion criteria were solitary tumor with tumor size?5cm and located in peripheral segments (segment II, III, IV, V and VI). Patient characteristics, operative data and initial post-operative outcome were collected prospectively and analyzed. Results: From May 2008 to July 2009, 24 patients underwent laparoscopic hepatectomy were included. Fifteen patients were male and 7 were female. The mean age was 58.4±13.5 years. There were 7 anatomic resections (left lateral segmentectomy) and 15 subsegmentectomies. Conversion to open surgery was required for two patients because of difficult tumor location and major bleeding. The mean tumor size was 2.9±1.5cm and all surgical margins were free for malignancy. According to Metafir fibrosing stage, sixteen patients (66.7%) revealed moderate to severe liver cirrhosis. The mean operative time was 243±80 minutes and blood loss was 472±572c.c. (range, 30-2300c.c). The mortality and morbidity rate were 0% and 4%. One complication of bile leakage developed on 8th post-operative day need a second surgery. The mean hospital stay was 5.2±1.8 days. Conclusion: In carefully selected HCC patients even with liver cirrhosis, laparoscopic hepatectomy was feasible and safe. However, more experience and long-term follow up is still needed.